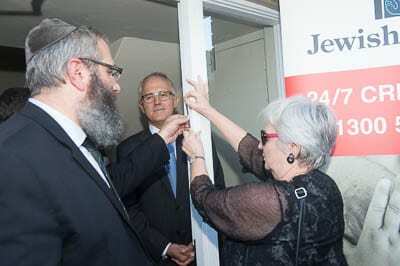 Federal Minister for Communications Malcolm Turnbull cut through the red tape straddling the entrance to Sydney’s Jewish House’s latest venture…First Base, a 14-roomed Bondi building which will offer temporary housing for the homeless. The apartment building houses three family rooms, seven rooms for couples and four rooms for singles…all available to homeless people from all denominations. 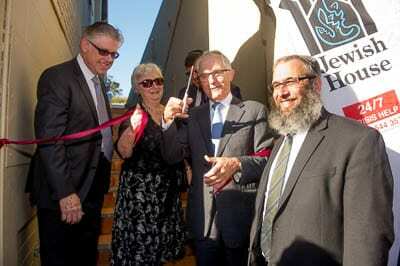 The building os on the registry of many agencies dealing with the homeless, including JewishCare whose president Alan Vidor attended the opening. The building, including its conversion, cost $3 million aided by a donation from Nora Goodridge of $1 million over five years. Rabbi Kastel said: “We will always need funding for this project and rooms are available for dedication. The building is situated in Bondi just 200m from Jewish House itself and many of the rooms have commanding views over a park and top floor rooms have an ocean outlook. First Base / Rapid Rehousing is an exciting new project aimed at providing Step-up subsidised housing. We are excited to be launching our new Building and Program on Bondi Road which will have 14 units with a mix for Singles, couples or family units. The main focus of the project is to assist people who are Homeless or at risk of becoming homeless but who, with support, will be able to gain long-term employment and sustain their tenancy. Clients accepted for the First Base Re-housing Programme must meet certain criteria according to FACS Specialist Homelessness Services (SHS) Case Management Foundations, and must be willing to engage with Jewish House Social Workers and follow a Case Plan over a three to twelve month period. The accommodation is a newly refurbished, fully-furnished building offering TV and Internet connections in every room in a convenient location close to Bondi Junction, on transport and across the road from Waverley Oval and playground. A Case Plan is an agreed document between Jewish House and the client. It is an evolving document that changes with the client’s needs over time. One of the main components of the Rapid Re-housing Programme is the partnerships that Jewish House has developed with other organisations and the ability to work in collaboration with other agencies for the best possible result for our clients. Jewish House will continue to work with clients until they are completely self-sufficient and integrated back into the wider community. Even then, the Jewish house open door policy allows clients to return at any time in the future if they feel the need to talk or for further assistance.